We do not any download links to this soft copy. 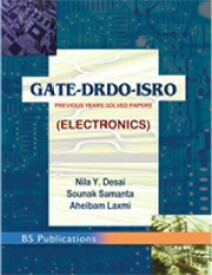 This Book covers Previous Years' Solved Papers (Questions with Detailed Answers) of GATE Examinations (1999-2011 : Past 13 Years), conducted by Indian Institute of Science / Indian Institute of Technology, DRDO SET Exam Solved Papers (2008-2009 : Past 2 Years), conducted by RAC, New Delhi and ISRO Centralized Recruitment Exam Solved Papers (2009-2011 : Past 3 Years) for Scientists and Engineers in ELECTRONICS ENGINEERING. The answers are provided with detailed explanations and with reference page number of standard book(s) for each and every answer, keeping in mind the undergraduate student community. Nila Yogesh Desai ME, is presently working as Assistant Professor in Electronics Engineering at National Institute of Technology (formerly known as SVREC), Surat. She has forty-two years of teaching experience. She taught several subjects in Electrical and Electronics Engineering. She headed the Electronics Engineering Department for several years. She is also Coordinator of VLSI Design SMDP-II program (Ministry of Communication and Information Technology). Her research interests are in the area of Digital Signal Processing and Digital Communication. Sounak Samanta BE, (with Gold Medal) from National Institute of Technology, Surat, in 2006. He then joined Defence Electronics Research Laboratory (DLRL), DRDO, Min. of Defence, Govt. of India as Scientist 'B'. Presently he is involved in design of IFM and DF algorithms for Electronic Support (ES) application. He has received DRDO Lab Level 'Technology Group Award' in 2009 for significant contribution in 'Design & Development of DDIFM Technique for Electronic Support Application'. He is member of IEEE (USA), IETE, ISTE, RMS, IMS, ISCA, ACEEE. Aheibam Laxmi BE, (Topper in ECE) from Manipur Institute of Technology in 2006. In 2007, she joined Defence Electronics Research Laboratory (DLRL), DRDO, Min. of Defence, Govt. of India as Junior Research Fellow and worked towards the 'Automation in Measurements' and 'Digital Phase Quantizer'. In 2009, she joined Research Centre Imarat (RCI), DRDO, Min. of Defence, Govt. of India as Scientist 'B'. Presently, her area of interests includes design of DSP processor based digital controller. She is member of IETE, ISCA, ISTE, ASI. 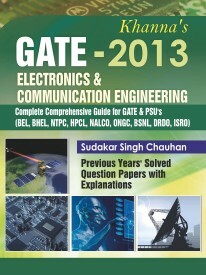 GATE 2013 ELECTRONICS & COMMUNICATION ENGINEERING book contains topic wise solved 13 years paper of GATE in Electronics & Communication Engineering and 5 fully solved new questions for GATE examination to provide an approach and relevancy for the GATE Examination. Efforts have been made to provide error free answers & tricky solutions and explanations. It has been kept in consideration that the book should fulfill the need of GATE examination standard and syllabus. Gives complete solution to the problem with relevant explanation. Easy solutions, with clear explanations of concepts, and strategies to solve faster. Some solutions are provided in detail. After going through the explanation the students will become capable of solving similar problems. 5 fully solved Test Series with solution to endorse confidence in the student. Sudakar Singh Chauhan is presently working as an Assistant Professor in the department of Electronics and Communication Engineering from last 5 years at Graphic Era University, Dehradun, India. He received M.Tech (VLSI Design) from NIT Hamirpur. He is pursuing PhD from BITS Mesra, Ranchi. He worked as a researcher in IC Design group at Central Electronics Engg. Research Institute (CEERI) Pilani. He worked in BSNL (BSNL_JTO) as a Switch Engineer and later on resigned so that he can contribute his knowledge & experience for the betterment of young generation. He has been involved in GATE preparation classes and has taught several core courses like Electronics Devices & Analog Circuits, Digital Electronics, Signals & Systems, Control Systems, Microprocessor, Analog and Digital Communication etc. any one got mail for written exam roll number. Or about selected for written exam Plz leave comment. Nice to hear you. Thanks for your reply Bro.okay i knw some informatio abt isro . Give your mail id.. We can share some info abt isro. Really it ill help us. which among above given books is best..anyone brought?? which 1 is d best book for isro? 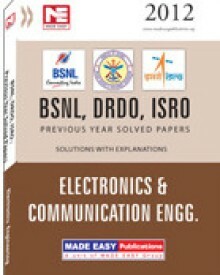 could you please send me last 6 years all sets (a,b,c,d,e)key/solutions of isro question papers of Electronics and communication? i lik to work in isro. i completed b.e. ECE. can anyone help me plsss???? is any book for computer science students? plz send me last 6 years isro-- electronics and communication question paper with answer key as soon as possible to my mail "rhhssprasad@gmail.com"
Please suggest some book for Civil Engg. for GATE &ISRO exam preparation. please suggest me which books i have to refer for genco exam for ece. can you provide me the material? if anyone have any material for ece mail me..
which book should be use tell me the name of book or author.